There are many on the internet that will try to convince you that the conflict in Israel is not a religious one. They will tell you that without the settlements there would be peace. Understand? Without Jews living in Judea, there would be peace. Besides the obvious bigotry hiding in that sentence, here is a video, that should be seen by anyone and everyone, that will prove beyond a doubt what this conflict is really about. There are no two equal sides to this conflict and if you watched this official PA cleric explain in detail how Muslims should murder Jews (Not Zionists, JEWS!) and you still stand in support of them, you are a full fledged, old school anti-Semitic bigot. 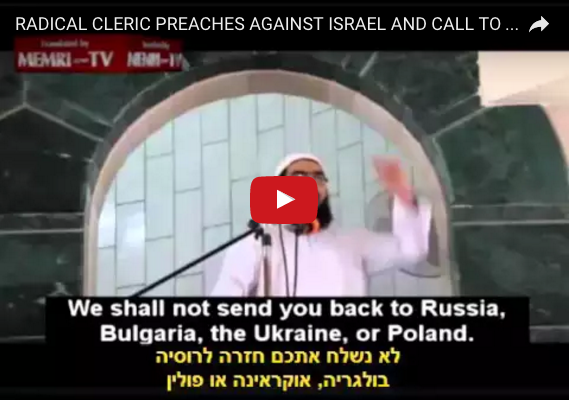 Where was the Muslim outcry against the "religious" cleric above? Where are all those who say Islam is a religion of peace? Where were the Israeli Muslim Parliament members who scream bloody murder when Israel takes out an Islamic terrorist? Would it be fair to conclude from the TOTAL silence and support this Islamic terror supporting bigot that there is no opposition? No more hiding behind some liberal hogwash to masquerade one's hatred for Jews with political stupidity. This war is a culture war and Israel is the warning the world better start to see. These radical Muslims don't need land or a flag and their target is not Israel, it's anyone who does not accept the Islamic way and the world better WAKE THE %^& UP! Become part of Israel's Shield!